The BlackBerry notifications are a wonderful thing. The killer combination of that flashy red LED and the ability to change the sound for nearly any alert gives you total customization. For some, audible alerts are great. For others, silent is the way to go. But for those who prefer to stick to vibrate, your profiles don't have to be boring. In older devices it was either vibrate or don't vibrate, but in newer OS version we now have the option to set not only the count for vibrating alerts, but also the length. So now there is a whole new world of vibrating possibilities before you and you can have different vibrating alerts for different notifications -- so you'll know what's what just from the vibration pattern. 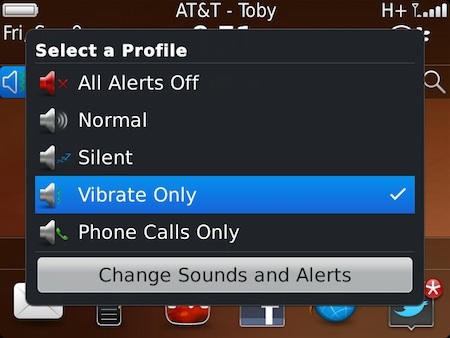 Keep reading to learn how to set up your Vibrate Only profile. Setting up sound profiles is a fairly easy task. Choose what alert you want for your various apps and events, set your volume, LED and count ... done. 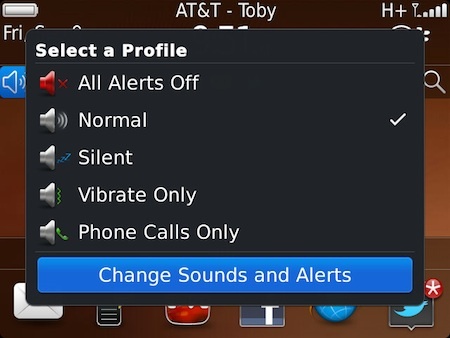 Vibrate profiles work basically the same way with a few different options. 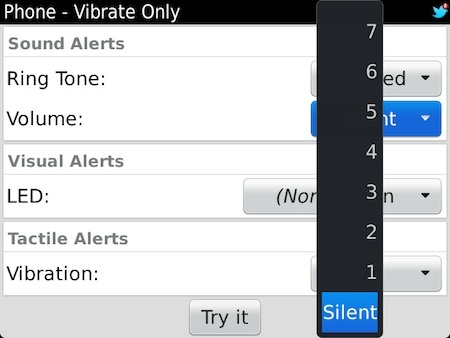 To get started setting up your Vibrate Only profile, follow the steps below. Select the Profiles icon on your device (either from your applications or the banner icon), then choose Change Sounds and Alerts. 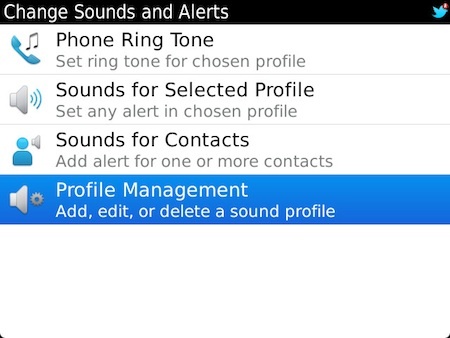 Choose Profile Management, then choose Vibrate Only. 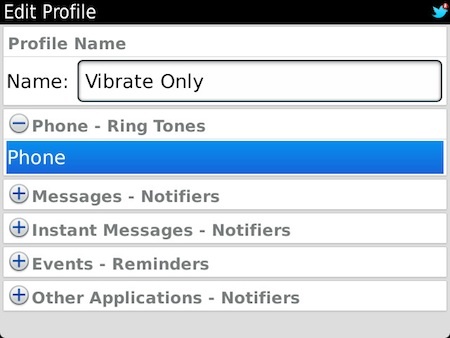 Here we have all the options for our Vibrate Only profile. We can change alerts for phone, email, BBM, IM, calendar, 3rd party apps and more. To get going, we'll start by changing the phone alert. Since our profile is vibrate only, you'll want to make sure the Volume for the chosen ringtone (it doesn't matter what tone it is since it won't sound anyway) is on Silent. Scroll down to Vibration. This will be sent to On which is the lazy mans vibrate -- we're all about going custom. Change Vibration to Custom. 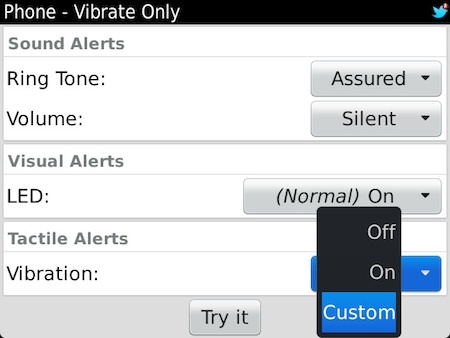 Now we get to set our vibrate options. Things to keep in mind here that you want different vibration patterns for different alerts, so try to remember what you set for each as you go. For the Phone, you most likely want it to be a long alert so you don't miss a call. For this I set Length to Long and Count to 10. This gives you 10 long vibrations which is perfect for phone calls. Also make sure you set your Holster options here (if you don't use a holster then set this to Always). Press the Menu key and Save. On to email. Click on Messages - Notifiers, then choose your main email address. The steps for this alert will be the guideline for the rest of your alerts. Again, the Notifier Tone here doesn't matter, but you'll want to make sure the Volume is on Silent. Choose if you want the LED on or off (depending on what you like). For Vibration we again choose Custom. Now is where it gets fun. You'll have to choose what kind of alert you want for your various events. For emails I like to go short and sweet -- so for Length I choose Short and Count is 1. This gives a quick buzz when an email comes in so I know it's there, but it's short enough to ignore. Choose whatever fits you best for the Length and Count. Change your Holster option if necessary, and decide if you'd like the alert during phone calls (if so check the box) then press the Menu key and choose Save. All of your alerts will be setup in the same manner from here. You can tweak them to your liking, using short vibrations for emails, longer ones for SMS, medium for calendar reminders. I like to have quick ones for emails, 3 longs ones for SMS and 5 short ones for BBM. It takes a bit of learning but in only a short time you'll know what vibration means what. This will give you a great vibrate profile to work with as you'll be able to feel the vibration and know just what type of notificaiton you have. It comes in very handy in an office setting, during a meeting or when you're out to dinner. For more on setting up sound profiles, check out our video walkthrough here.